At a record of 520 metres deep, the Sea-Dweller is still in its element. The Comex divers have once more forced forward the frontiers of the impossible. Diving off Marseilles, a six-man team spent eight days performing complex underwater tasks at the unprecedented depth of 520 metres. An astonishing breathing mixture, hydraliox, made it possible for them to live and operate at such inhuman depths. Hydraliox is a combination of hydrogen, helium and oxygen. It gives divers complete freedom of movement with minds unimpaired by pressure effects. The Comex operation, known as Hydra VIII, is a world record, comparable in its own way to man's first moon landing. It has created huge possibilities for research. Tomorrow, thanks to the divers' determination and skill, men will descend even deeper, to repair oil rigs and explore the ocean floor. Beneath the pressure of over 500 metres of water, there is a ceaseless need for precision. At such astonishing depths divers must depend on something rather more than a mere watch. They need a veritable measuring instrument: the Rolex Sea-Dweller. 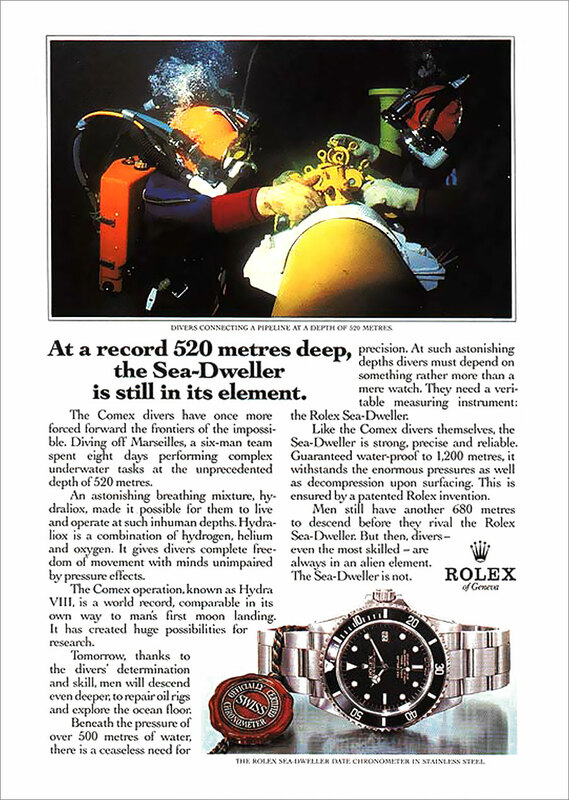 Like Comex divers themselves, the Sea-Dweller is strong, precise and reliable. Guaranteed water-proof to 1,200 metres, it withstands the enormous pressures as well as decompression upon surfacing. This is ensured by a patented Rolex invention. Men still have another 680 metres to descend before they rival the Rolex Sea-Dweller. But then, divers–even the most skilled–are always in an alien element. The Sea-Dweller is not.